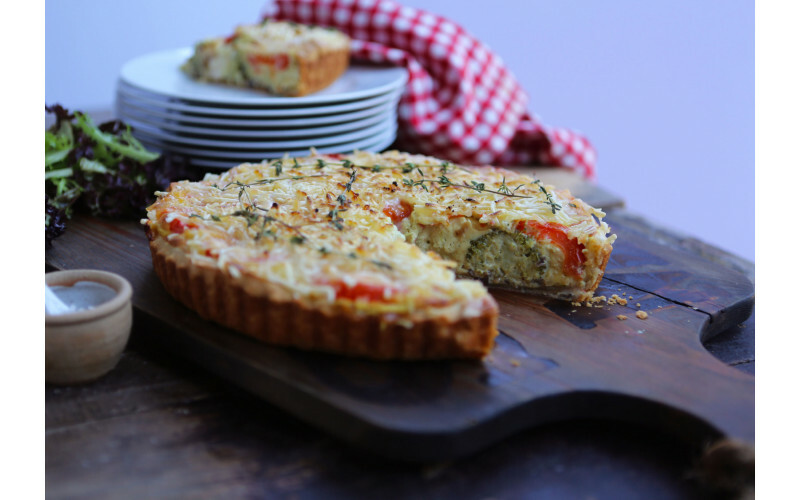 A few new twists on our old deluxe quiche recipe to make it super delicious. If you'd like a gluten-free base then check out the recipe here. Easy, simple and so tasty... this one is definitely a crowd pleaser. 1 block Jus Rol shortcrust pastry (or other vegan, supermarket own brand, check ingredients). See this recipe for gluten free pastry option. Fry the onion in 2 tsp oil for around 5 minutes until softened. Add the garlic and then fry for a further 2 minutes. Meanwhile, steam the broccoli florets for around 3-5 minutes until just slightly crunchy, not soft. Blend the cream cheese, tofu, plant milk, Dijon mustard, nutritional yeast, lemon juice, syrup, turmeric, salt and pepper until fairly smooth. Stir in the herbs so they're evenly distributed. Arrange the broccoli, tomato slices and onion/garlic mix around the pastry case, evenly. Pour the filling mixture on top, distributing it evenly with a spatula. Sprinkle the melty vegan cheese on the top. Bake in the oven for 30-45 minutes or until firm in the middle. Check after 35 minutes, as the time will vary depending on your oven. Allow to cool a little before cutting and serving.